Protects dogs against fleas and ticks for up to 6 months. Improved formulation kills fleas on contact and is effective against three species of Ticks, Deer Ticks, American Dog Ticks, and Brown Dog Ticks. The collar is odorless and has time released technology for continuous protection. Each tin contains two individually packed and sealed collars. Each collar provides continuous protection for up to six months, giving you twelve months coverage with each purchase. 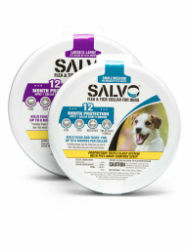 The Salvo collar is water-resistant and remains effective following a bath, swimming, or after exposure to rain or sunlight. The Peel-Away comfort strip provides a smooth surface to minimize irritation, and the proprietary triple clasp system ensures collar stays engaged in the most demanding situations. Collar can be used on dogs and puppies older than 12 weeks.